The industrial perspectives set out in the SWP’s Internal Bulletin 2 are on the face of it comprehensive. They deal with at least two different types of trade union (both Unite and the public sector unions), and different kinds of trade unionism (rank and file, regional and national bureaucracy). They are equipped in a language which is familiar (“low level of struggle” … “lack of confidence”), so that on a shallow reading they feel immensely reassuring. It could be 1990, it could be 2012, it could be any year in between. Nothing much has changed because nothing needs to change, because the party is doing the right thing. The documents’ seeming breadth conceals the fact that there have actually been two significant changes in the party’s industrial strategy in the last 10 years. To understand either of them, you need to go back to what the SWP was like for most of its history. In the thirty five years or so between the launch of the Socialist Review Group (our distant predecessor) and the Miners Strike of 1984-5, the party’s basic theory was that workers were the class that would bring socialism into being, trade unions the schools in which workers would learn socialism, and strikes the mechanism by which workers would learn the possibility of socialism. We used to have a very direct focus on the rank and file, in the workplaces, and the lowest level of the trade union. Often critics on the left would call us “syndicalist” because of the very simple, direct and even at times myopic way we focussed on the rank and file. Around 10 years ago, the party changed its emphasis and began to argue for a reorientation of our efforts from the rank and file to the middle reaches of the unions, above all, their NECs. This change was subtle, but in some parts of the union movement it took effect rapidly. In 2003, SWP members in Unite were first told to increase their faciliy time, to 100% if acheivable, and there was the first serious attempt to solicit names to stand for the union’s NEC. Prior to the merger of the two FE/HE teaching unions AUT and NATFHE in 2006, the SWP had 2 members on the National Executive of NATFHE and none on the executive of AUT. When the unions merged, members were instructed to stand for the combined executive, and all of a sudden, there were around 30 SWP members on the NEC of the new combined union, UCU. Similar, if less dramatic moves were made at the same time in PCS and NUT. And they would of course also have been made in RMT, FBU, GMB, CWU, Prospect etc – if the SWP had had more than half a dozen members or so in any of these unions. Those who listened to the party’s industrial office would have heard that behind this strategy there was a plan: pensions was the coming issue, it would unite all the public sector unions, and their joint struggle would be on an epic scale. When people put their politics honestly, it was accepted that this was a refocussing of the party’s efforts away from the rank and file. Full-timers would accept that it is barely practical for someone to both police their union’s national leadership from a seat on the NEC, and be a rooted champion of the union in their own workplace. But the change was justified for specific and contingent reasons. As we now know, the plan reflected the hopes of a very small number of senior trade unionists, one or two of whom were tied by close bounds of friendship to individuals who were then in the party’s industrial office. They wanted a united campaign to defend pesnions, and fought hard to get one. There was indeed a united public sector one-day strike in 2011 as a result of which the number of strikes that year rose temporarily to a level (1.4 million strike days) which now qualifies as acceptable. By 2011-2, the party had decided to put this maneuvre on a semi-permanent basis by closing down its existing “United Front” Riht to Work in favour of a new campaign Unite the Resistance (UtR), which we were eventually told – about a year after it had been launched – would (in theory) bring together the rank and file of the trade unions with the leadership, the idea being that the militant demands of the former would spur the latter into action. UtR we were told was not a rank and file organisation, as there was no basis for one, but an alliance with the bureaucracy, out of which it was hoped more strikes would come. The old SWP would have been sceptical of moves of this sort; certainly our literature used to contain warnings about the similar justifications that were once given for Broad Lefts in the union or for Liasion Committees of the union lefts. We have, in effect, been copying the industrial strategies of the Communist Party but without its union base. Indeed, the last twelve months’ party crisis has in many ways exacerbated the shift: witness the last UtR conference, with numbers down by a half from the year before. Fewer trade union leaders were present (they know how the last year of scandals has damaged the party’s name and have no desire to be associated with us). No-one was asked to criticise Bill Hayes, even though his union CWU has been relatively passive in response to the enormous threat of privatisation; we simply don’t dare criticise the bureaucrats for fear that none of them will come back for the following conference in another year’s time. In the present faction fight, many critics from within the faction have criticised the leadership for exaggerating the potential of the public sector unions and for lack a strategy towards the private sector unions, and for being over-reliant on the hope that the pensions dispute will simply repeat itself, and for ignoring the tendencies in the class towards the atomisation of employment. The boldest voices have gone further still and pointed out that the party’s explanation for the lack of struggle by workers is so general as to be unpersuasive. For a century before 1985, statisticians were collecting the number of days lost each year to strike action. Only once in all that time (1927) were there as few strikes as we saw in 2011. 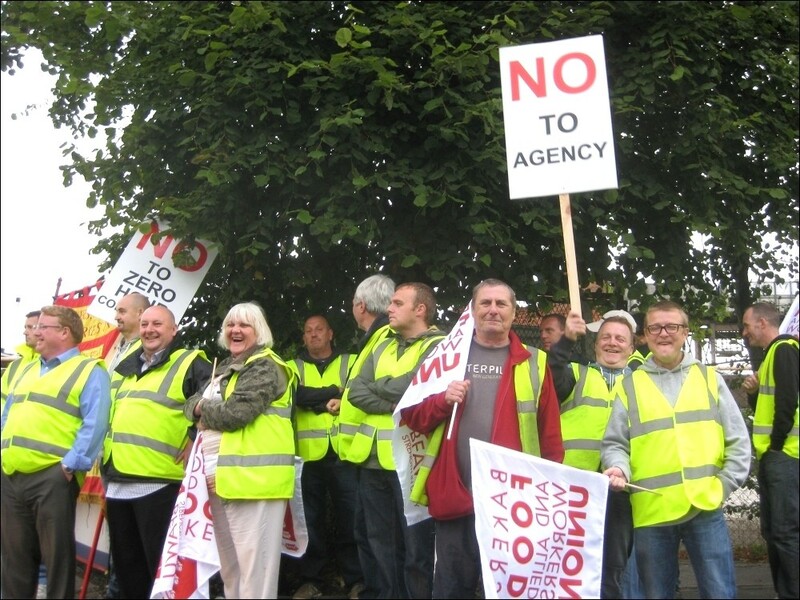 Strike figures in five of the last six years have been less than half of 2011’s figure. This is a historic level of inaction; to blame it all on lack of confidence and bureaucratic inertia (factors which were as true in 1986 as they are today) is to provide an explanation which is so general it is incapable of being wrong. We use “bureaucracy” and its synonym “intertia” to explain everything from the strike-prone National Union of Miners in 1984 (a single trade union with hundreds of millions of pounds of assets and over a hundred employees) to the caution of the leaders of the present-day federation of Independent Trade Unions in Egypt (which, though undoubtedly “bureaucratic”, has barely a single employee, and no-one on 100% facility time, and this in a federation counting its members in the few millions). If “lack of confidence” was to be an explanation rather than a mere comfort-blanket, it would need to have a history, and some explanation about when and how it becomes its opposite, “confidence”. For the moment we have but the simple truism that workers who haven’t struck recently will lack the confidence to start now. But if the idea is not to tail events, nor to revel in an unending cycle of workers’ passivity, but to change that pattern – then we need to start thinking for example about “who” it is that unconfident workers might look to inspire greater optimism (and if the answer is only “the bureaucracy”, we might as well give up now). There has been little discernible shift in the last year in the actual operation of the SWP’s industrial office: we still focus on providing leaflets for union conferences, and for NECs, we still give far more time to relatively small public sector teaching unions in which we are disproportionately represented at the expense of larger, manual unions such as the GMB or UNITE. But those with a keen eye will have spotted an incremental movement of the leadership’s perspective in the direction of the faction’s. Even before this year, during the public sector co-ordinated strikes, the SWP had produced quite a lively pamphlet by Paul McGarr, more recently, it has held industrial day schools for new members. This year, after long periods of silence, Socialist Worker has at least published some articles about Unite and about zero-hour contracts (and in fact SW has written well about the latter). There is a little less of the old assumption that every person in the workplace has the same security of tenure and hours and opportunities as a secondary school teacher Head of History with 20 years’ service. The industrial perspectives document written by the SWP CC for our Internal Bulletin admits (significantly) that the pensions’ strike was a “bureaucratic mass strike”, something we would not have dared acknowledge even six months ago. We should not exaggerate the extent of the correction. You still find misrepresentations such as the following: “We’ve seen other comrades raise arguments that mirror descriptions of the “salariat” with claims that public sector workers’ wages and perhaps their “gold-plated pensions” offer an explanation for their failure to fight.” No – that’s a mangled reference to things which I’ve written, and the author stands my argument on its head. What I actually argued was that even if teachers fight (and yes, they have reason to), their strikes will not lead to cumulative radicalism throughout the class because (right or wrong) most workers don’t see teachers as having the same sorts of lives as themselves. Strikes by nurses or electricians might have that radicalising capacity; strikes by teachers don’t. This was never a criticism of teachers, but of a party which is over-reliant on them. Here is an acceptance that the most important struggle in recent years, from the perspective of rebuilding rank-and-file organisation, are the ones which the faction talks most about: “the Sparks victory in 2012, the brilliant victory over the Hovis bosses more recently, Crossrail being forced to re-instate Frank Morris”. I would like to pretend that this latest shift represents the brilliant insights those of us within the faction who have been criticising the party’s drift into a bureaucratic approach. It would be nice to say that the different approaches of people like Ian A-, Jamie W-, etc have been so well-put and so obviously true that a reluctant leadership has had to admit the wisdom of our arguments. In all truth, I suspect the reason for the change is that even the CC accepts it cannot afford another year spent waiting for a public sector strike. In July, supporters of our leadership were told to expect an “upturn”, i.e. a national one-day teachers’ strike, by Christmas. An offer from the government of talks was enough to stymie those hopes; and without the NUT taking part, the prospect of a co-ordinated public sector strike is limited. Marxists of all stripes (inside the SWP or out) face the same problem. Our politics requires the self-activity of millions of working-class people. We say that socialism will come about through strikes and other protests in which the vast majority of people will take control of their lives. But strikes are at the lowest level in more than 100 years; and they are not being supplanted by other forms of recognisably working-class protest (rent strikes, bread riots, or anything similar). Internationally, the demand of the moment is “democracy” but in only few places has the democratic struggle reached such an intensity that workers struggle could be said to have differentiated themselves from the rest of the democratic movement, so that you can talk about workers emerging as the class which could lead society. There was the hint of that process taking place in Egypt, but most of the British left, including even comrades in my own party, have refused to see it. Socialists should be far more confident about using trade unions to democratise workplaces. A single example: there is a great desire within the trade union movement for branches to elect “green reps”, i.e. activists who would take up the challenge to make the workplace more sustainable. Where this is done, no doubt management might initially approve. “So the union will be the one who will find out how much money the company could save if we changed our suppliers of paper and light-bulbs. You’ll be the one who’ll find us a better recycling contract. Good, it’s less for us to do” But a good green rep would go much further, and demand not just the employer’s annual accounts but their underlying financial data, an assessment of who they were ordering from (and the suppliers’ record as employers) carry out carbon audits, and (in short) democratise the actual running of the business. The best health and safety reps terrify their employer; some equality reps, those who use the moral high-ground of their position to undermine management’s authority to manage, have something of the same character. Even when the immediate prospect is not one of repeated strike victories, it is still possible for a union to raise the question of who controls the workplace – if the branch takes a political stance, and large numbers of workers champion it. Who will train the activists to do this? Unions train their stewards; Unite’s community branches are, in a sense, the training-ground for a generation of future reps. A key weakness is the far left. Someone who joined the socialist left either forty years ago (through the IS or the IMG) or 65 years ago (through the CP) would quickly be trained in organising as a revolutionary trade unionist at work. These days, the reps; schools are too rare, and not followed up by further events. The left also needs to be much better at championing the victories that there have been. When the Sparks struck, the SWP produced a pamphlet describing the roots of their victory. Nothing similar was yet been published over Hovis, and the party’s acknowledgment of Frank Morris’ victory has not been underpinned by any serious assessment of how it was possible. It certainly wasn’t a legal victory (if the case had got to a final hearing at the ET Morris, instead of being stuck in a series of preliminary hearings, Morris would probably have lost). But nor was it a simple triumph for the rank and file either. There were was never a strike across the Crossrail network or supply chain; much of the “heavy lifting” was done by small groups of activists, blocking the road, etc, in London with the blessing of Unite. We need to be much better at understanding the dynamics of blue-collar and private-sector trade unionism: 6 out 7 workers in Britain work in the private sector. Only 26% of workers do jobs that require a degree. Although the party has begun to publish articles about Unite, we have never properly explained to most of our members what Unite’s strategy is or what its key weakness are. My view in brief is as follows. Unite has taken over an organising model which derives its ancestry ultimately from the decisions of the CIO industrial federation in America in the 1930s. The CIO was able to pull off an extraordinary series of organising victories – the most heroic in the history of American labour – essentially by giving young militant from left-wing backgrounds complete freedom to organise in non-union workplaces. Victories brought momentum, recruits generated publicity, and in double quick time, the steel and car production industries were unionised, more or less from scratch. Unite’s organising model emulates the CIO in that Unite organises more like a federation than a union, and emphasises recruitment rather than sustained workplace organising, and is open to employing activists even from the far-left, as it needs the energy of militants to deliver public victories. (and I mean employing – ie recruiting from outside the union people who have previously been reps or NGO campaigners or been involved with the left parties and giving them jobs on the Unite payroll). The model has been tweaked a little compared to its historical inspiration; Unite talks about “leverage” (ie well-financed publicity campaigns involving selective litigation, putting pressure on Labour councils, etc) as being just as important as strikes. And of course Unite’s industrial model overlaps with its other policies: the ambition of recruiting thousands of its members to the Labour Party with the idea of them pulling Labour to the left, and the setting up of branches for unemployed activists who are intended to be next year’s union activists. But all these tweaks only accentuate the central weaknesses of the model – recruitment is dependant on teams of full-timers rather than stewards, there is a much clearer vision for winning recognition in workplaces where the union is not recognised than there is for developing existing workplace reps where the union already has a presence. I have gone into this in some detail, because of course the recent catastrophic defeat at Grangemouth makes more sense if you grasp why the union, which had a base in the factory, had allowed that base to weaken. I won’t repeat here what went wrong at Grangemouth, save to note that the workplace is of vital industrial importance (the SWP CC argue in IB2 that the mere threat of strikes at the plant was crucial in early 2012 in delivering the Sparks’ victory), and that the defeat began with the isolation of a steward accused of using his position to recruit workers to the Labour Party (i.e. doing exactly what Unite wants its stewards to do), when he was named by the Labour Party and subject to investigation. This news undermined his position and enabled the employer to counter-attack. Unite had the backing of majorities willing to take action, but was out-manoeuvered by management. Throughout the dispute, Unite’s favoured weapons (eg leverage) counted for far less than they would in an unorganised workplace. The party has tended to blame the defeat on the absence of an organised, independent rank-and-file, and on the power of a bureaucracy which never fights. These explanations are too general; they fail to account for why there was no rank-and-file at Grangemouth itself, particularly as it has been part of rank-and-file action in recent years. And they miss out altogether the relationship between Unite’s industrial strategy and its defeat. It wasn’t “the bureaucracy” in general which let down the Grangemouth workers, but the McCluskey team. There needs to be a much clearer argument within Unite and within the unions (eg GMB) which are following Unite’s lead – away from leverage towards the possibility of solidarity action, which is ultimately the best and only solution to weakness in any particular workplace. Finally, the CC write, “we also need to make sure that SWP branches and districts have a serious industrial strategy”. A starting point would be for the organisation to have its own, national strategy – not a statement of eternal truths (strikes are few, workers lack confidence) but an attempt to predict where protests might break out, and a prioritisation of certain kinds of workplaces. 1. The trend towards “atypical working” will continue – ie expect an increase in the number of self-employed workers and workers on agency and temporary contracts, and possibly the number on zero hours contracts. In the private sector, there are still entire employers experimenting with new contractual forms which take, in a single stroke, tens of thousands of workers out of employment. In the benefits system, there are still private companies urging claimants to swap employment for insecure contracts relabelled as self-employment. Sooner rather than later, the proportion of all people in the workplace who are directly employed, permanent workers on full-time contracts will fall below 55%. 2. Resistance continues in construction – particularly in the power generation sector, and there were 150 pickets at Ferrybridge this week. But if the left was to provide them with meaningful assistance, this would require us allocating resources (people, time, materials) to their campaign. It is hard to get into the habit of backing a nascent movement, when much of the party’s industrial work revolves around speaking to the bureaucracy rather than striking workers, and when we have got used to always responding to events not shaping them. 3. Grangemouth is a defeat (a 3 year no strike deal in a strategically significant workplace…) and will have a negative pull on other workers. Its effects will be felt by the groups of workers who are closest to it, industrially and geographically. The next breakthrough is unlikely to happen among Unite members in Scotland working in the power industry. 4. There are likely to be more pay strikes in 2014 than there have been in 2013. Real wages have fallen further in this recession that in any previous recession since the 30s. As employment rises, people’s fears about holding on to their jobs will lessen – if slightly, to begin with – press stories about how the economy is booming out of recession will also intensify workers’ resentment that they are being left behind – and strikes will come slowly back into the realm of the possible. 5. Hovis is capable of being replicated – whether that means more strikes in that industry, or in related industry (eg canning, food factories…) or in Wigan or around the same issue (zero hours contracts) I don’t pretend to know, but people are more likely to copy strike tactics where they see others doing it and winning.